It’s the Tuesday just before March Break, and Carmen Gassi, OCT, is rifling through sheet music at White Oaks SS in Oakville. It’s easy to see why the music teacher and department head is clutching an extra-large coffee — at a few minutes before 7 a.m., it’s pitch black and −14°C outside the music room, a converted wood shop with ceilings higher than a transport truck. Minutes later, students shuffle in. One rubs sleep from his eyes while others flop into chairs to send warm-up blasts through trumpets, French horns and trombones before they spend the next hour systematically working the kinks out of several bars of a contemporary band piece. They get no credits or grades for being here this early, and they don’t seem to mind that most of White Oaks’s 2,000 students won’t appear until the bell rings 8:05 a.m. Playing in Gassi’s senior concert band is worth an hour of missed sleep. There was a time when Gassi didn’t have the luxury of uttering a line straight out of Glee. 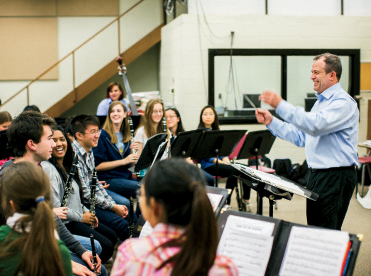 When he arrived at White Oaks 15 years ago, the once renowned arts program had been eclipsed by athletics — the school barely filled eight music classes and only a couple dozen kids turned up for concert band. As soon as the Grade 9s bagged their mandatory arts credit, most dropped music faster than a heavy backpack. This pattern didn’t quite work for Gassi. Call him selfish, but he became a music teacher in part to fulfill a dream of conducting school bands that students actually wanted to play in. Sure enough, his quest began to revive the arts program. 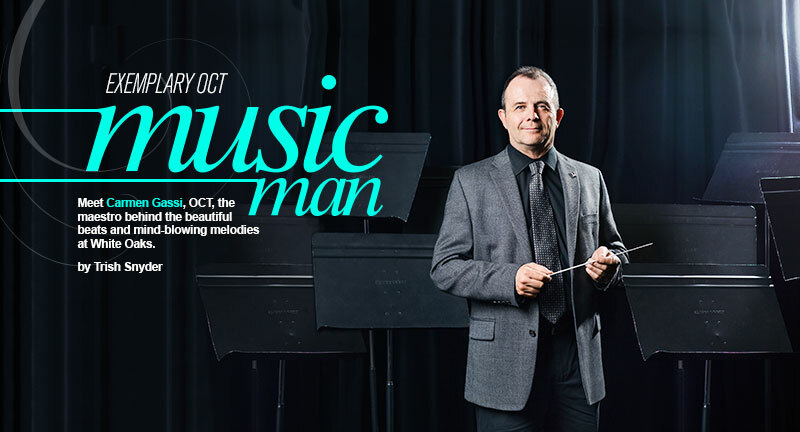 He inspired young musicians by taking them to music rooms across Canada, entering them in competitions and touring them around arts landmarks in Europe. He even introduced a cutting-edge computer lab where students could compose their own soundtracks. performance for the annual invitation-only MusicFest Canada competition. Playing in his high school band inspired Gassi to study music, and his passion has fuelled him throughout his 25 years of teaching. Outside of school, he conducts a community jazz group and plays clarinet with two orchestras, arranging for the senior band to watch him perform at the Mississauga Living Arts Centre with Opera Kitchener. While students are up late checking Facebook, Gassi is composing music for the school’s quintets, choirs and bands. “I feel strongly that if I spent that much time learning about composition in my undergrad, and performance in my grad, I don’t want anything to go to waste,” he says. Gassi’s love of music is infectious even when the instruments are packed away. During his Grade 10 Renaissance unit, he was sidetracked and shared Mozart’s penchant for gambling and Beethoven’s string of lovers. One class became so obsessed with the Medici family that he allowed them to detour slightly from his lesson plan. Students immersed themselves in researching details of Florentine life, then impressed him with newscasts, puppet plays and short films (all incorporating music, of course). He says it was worth it to see students so heavily engaged in learning. “The shortest distance between two points isn’t always a straight path,” Gassi explains. Back in the music room on that Tuesday morning, he uses technology to transport his Grade 10 music class from Oakville to medieval Europe. As students rhyme off the meanings for monophony and polyphony, he writes the definitions on the Smart Board. Then he asks them to imagine how a 30-second clip of a polyphonic Gregorian chant, played from his laptop, would resonate in a medieval cathedral. Another class on the timetable is Music and Computers, which takes high-tech learning to the extreme. In a specially designed lab, Gassi sets students loose to create radio jingles and remix symphonies with versions of the same software and hardware used at high-end production facilities. Toys and tangents aside, it was a SEVEC (sevec.ca) cultural exchange Gassi had organized that resuscitated music at White Oaks. Ten years ago, a high-school band dressed in matching uniforms arrived from Victoria in November and promptly blew the White Oaks musicians away. “The kids were amazed at how this band sounded,” remembers Gassi, who knew the visitors were playing a more challenging repertoire and at a higher level than his students. “I told them there’s no secret, they’re just working really hard. We’re not a school for the arts, so if you guys want to sound like that, I’m in, but it’s going to mean three practices a week. Are you ready for that?” When White Oaks flew to BC the following May, the young musicians were determined to impress their hosts — and so they did. Bonding is one of the happy side effects of teamwork. He’s quick to praise but doesn’t hesitate to holler “Whoa!” when the trumpets are sharp. Gassi guides with respect and patience because he relishes the process of helping students get better. He’ll even critique recordings of his own performances. “What makes Carmen outstanding is he is able to build a strong rapport with kids,” says principal John Stieva, OCT.
Want to keep in tune with the times? Carmen Gassi shares his top four music apps and a key online resource that are sure to strike a chord. Be sure to keep an eye (and ear out) for Gassi’s very own soon-to-be-released app that will no doubt help music teachers hit all of the right notes. “This is convenient when I have to share large MP3 files or music scores, since email programs have a limit.” Perfect to use on all of your devices.